Although we only printed and installed these graphics for allRisk, they still show how branding your business with pickup trucks graphics is almost a must-do these days. Located in Marlton, New Jersey, Action Plumbing's Dodge Ram is the essence of simplicity. Why? First, the colors are very simple in red, white, blue with a small amount of black lettering. A viewer can easily see what kind of business this is (plumbing), their website, contractor license numbers and a telephone number. Another element of these van wraps is a trusted element; "trusted and recommended since 1965." Just enough color and information to grab consumers. 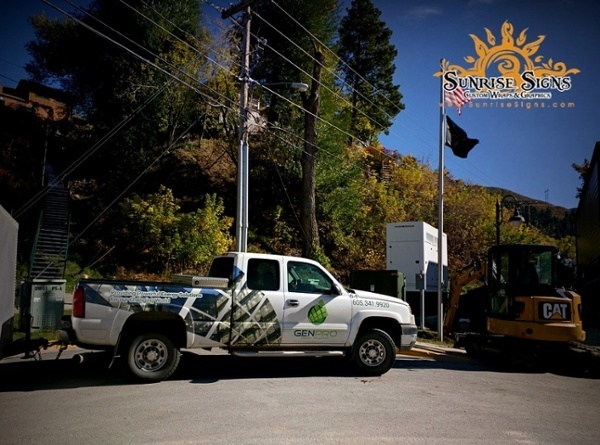 We added graphics for four of Genpro Energy Solutions' Silverados. This was part of an entire fleet graphics package. 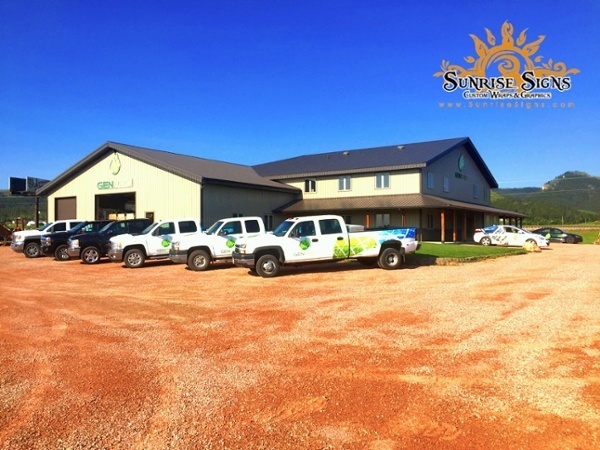 This was great fun for our designers and installers as this business is located in Piedmont, South Dakota. Again, the simplicity here is all about the logo. Because this business is well-known in the area for supplying and installing LED lighting, water and energy systems solutions, their logo was just enough to get their branding message across. No need for clutter yet still enough room for the business name on the side, their logo and enough graphic elements to show what this business is all about. Located in West Collingswood Heights, New Jersey, American Asphalt also looked for pickup branding that would catch the eyes of consumers. What's better than the colors and graphics of the American flag? For this Toyota Tundra, the graphics are a great representation of the U.S. flag but the other elements show important information viewers need to know. Their telephone number is very easy to see and read and one can quickly see they do seal coating, line striping, asphalt repairs and inlet repairs. Simple, yet effective pickup truck graphics like this are very often all one needs to get their business noticed. 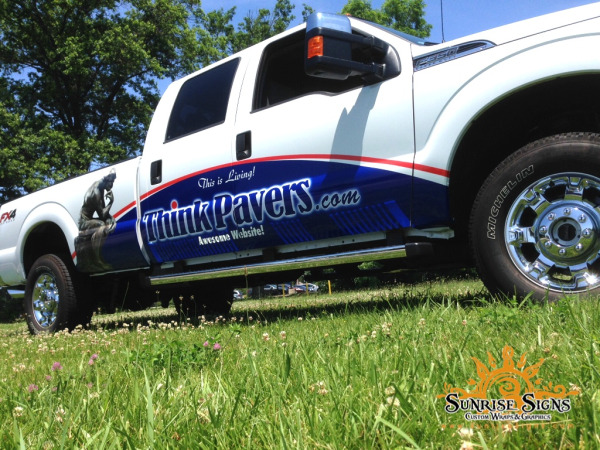 Think Pavers came to us with two Ford F-150 pickup trucks; one was modified with tool boxes on the side. Located in Swedesboro, New Jersey, this hardscape contractor also looked for simplicity and affordability. When it comes to adding pickup truck graphics, there are no set rules, even if your vehicles have quit the mileage on them. In this case we were able to add their "thinking man" logo, an easy-to-see and read website URL and their motto of "this is living." Just enough graphics to promote some interest for this contractor. Pickup Truck Graphics: A lot or a Little? You don't need to make a huge investment if you choose pickup truck graphics. Your vehicles also don't need to be brand new to make an impact. 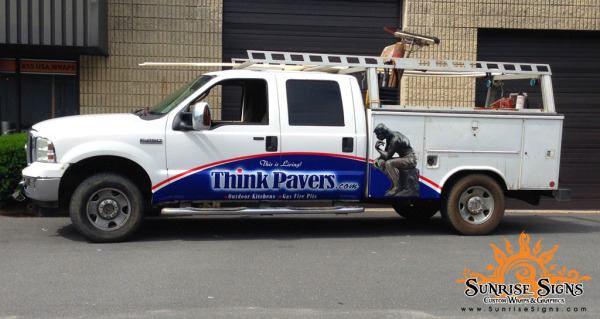 Affordable truck graphics and wraps are available in many styles and pricing options. After a look at just five modern examples of pickup truck branding using wraps and graphics, we know you're ready for a free quote!